Last week I did my usual gym sessions and yoga on a Tuesday, which I'm slowing improving at. My left knee still hurts when I sit cross legged, and maybe it always will. The muscle tone in my left leg (the one I had the knee operation on) has improved visibly. I've almost equalised it with the right leg. It's still a little down on climbing power, but it's getting there now. I didn't do a speed session last week since I intended to rack up some fairly serious mileage in the following days. I decided to reccie the majority of the LDWA Hills and Dales route. I will be taking part for the 4th year. It's an excellent, well organised, and great value for money event; run for charity. I can wholeheartedly recommend it. I parked in a quiet country lane a mile or two from the official start, and set our using the written route description to reccie most of the course. I wasn't really sure how much I would reccie, I just thought I'd see how I felt. So, I set off across the fields, some of which were marshy in places despite the hot day. The route description was clear enough, I just hope I can remember my way across so many fields and stiles. I passed through the popular Peak District village of Hartington and then headed out to the High Peak Trail, a popular cycling route. I then went into Earl Sterndale, correcting the route description as I went (it said go right, when it meant left! I told the organiser who's fixed it). I then checked the map, lef the route, cut across and headed back to the car. By the time I got back I had covered just over 20 miles, and almost 3000ft of ascent in just over 4 hours. This was probably further than I had in mind, but it was a nice day out and I really enjoyed it. It was useful for reccie the route, and should save me a little time when I take in the event itself on 5th September. Also at the weekend I went for a run with Clive, who I used for have personal training with, in my time building up for the MDS. Clive is training for a run over the Welsh 3000's (mountains over 3000ft) in a few weeks time. Clive drove us once again in the Peak District and parked near Buxton in the Goyt valley. We ran down Goyt's Clough before heading up quite sharply out of Stakes Clough and up to Shining Tor, which was considerably warmer than when I was last there. It was another warm sunny day, and very enjoyable running. Clive is much faster runner than me, and has completed the Bob Graham Round. I have put the whole Bob Graham round on my website, in both Google Earth and Memory Map format for anyone to download. You'll find it in the registered users section. It takes 2 mins to register. I have also put the Charlie Ramsay Round route maps, as well as many others in there for you to download too. Anyway, back to the run with Clive. I could keep up (though I daresay I wouldn't have done, if Clive had put his foot down! ), apart from the hills where he's much faster. All these photos are geotagged, so you can see where they were taken on the map if you click them (which takes you into Picasa). We ran along the ridge from Shining Tor to Cats Tor, then turned right at Pym Chair and down a welcome descent, over Errwood Reservoir and up an old dismantled Railway route. Then down the and very sharply up the Wild Moor valley, picture below, looking back from where we came. 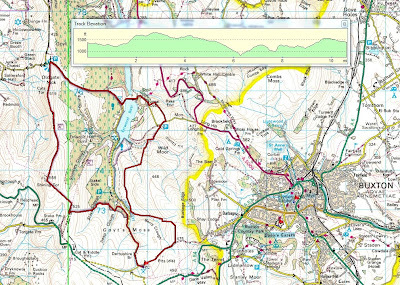 Then onto then onto Goyt's Moss and Berry Clough. The route was punctuated by some sharp climbs and sweeping descents, and plenty of Heather to wade through. I didn't realise how much ascent until I check back home. We covered 10.5 miles and 2400ft of ascent in just over 2 hours. So, over 30 miles covered in just a couple of runs this week, which is good training for the mountain marathon events I am doing soon (Rab and OMM). I am off to the Lake district this weekend coming, to practice for the Rab using the competition map from last year. I am looking forward to it. In some ways I hope the weather in nice. In others I hope it isn't, to give me more practice at navigating in miserable, challenging conditions. I've just stumbled upon this blog. Best of luck at Rab. Cracking route around Erwood reservoir.